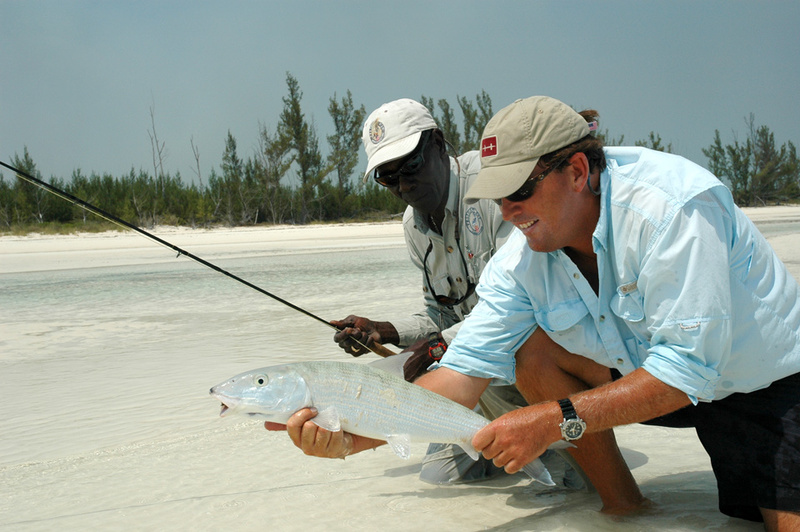 H2O Bonefishing, The Bahamas | Tailwaters Fly Fishing Co. Numerous commercial airlines service Freeport daily from several portals on the east coast making H2O one of the most convenient and affordable Bahamian destinations. H2o has a very technical approach to their fishing on the north shore of Grand Bahama, primarily focusing on large bonefish year round. Some of the largest bonefish in the world live here. 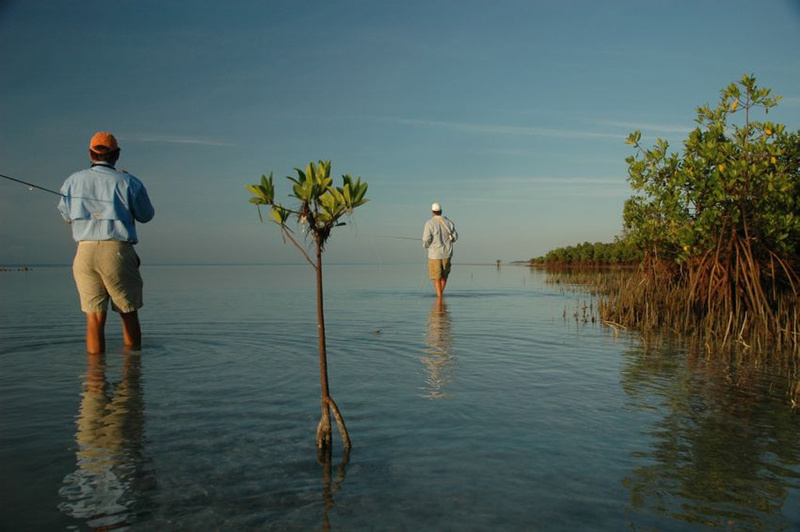 H2o offers good wading opportunities for bonefish in addition to fishing from the skiff – and anglers enjoy seasonal shots for permit, tarpon, jack crevalle, barracuda, sharks, mutton snapper, and even tailing triggerfish. H2o offers an afternoon offshore fly fishing program targeting yellowfin tuna and dorado as a combination flats / offshore day. Their “No Boundaries” program utilizes a 21’ Maverick that has opened up doors for exploring areas of the Little Bahama Bank not normally fished. The Spring months of March – May are invariably the most popular, but if flexible, anglers who time a winter trip properly enjoy some of the best bonefish fishing of the year with minimal pressure and the biggest bones seen all season. Summer months should not be ignored for their consistent weather patterns and opportunities for other species like tarpon and permit – as well as H2o’s unique offshore program for tuna and dorado. The autumn often enjoys beautiful springlike conditions and can be very productive on the flats for all species as well. Is H2O Bonefishing Right For You? H2O is the ideal Bahamian destination for anglers in search of bigger bonefish, an easy-to-get-to Bahamian fishery, and access to restaurants and a little nightlife. It is also a perfect venue to consider for folks wanting to combine the family or couple’s beach holiday without compromising world-class bonefish fishing. We send a number of anglers to H2O who are looking for a quick “fix” as well as dedicated anglers interested in a sophisticated flats experience on an extended trip. Shorter and longer visits, private room / boat, offshore packages, and suite upgrades are all available. Fishing packages include accommodations at the Pelican Bay Hotel, guided fishing, breakfast and lunch on fishing days, as well as hotel and resort taxes. Exclusions are airfare to Freeport, dinner meals, alcoholic beverages, gratuities, and equipment rentals. (See RATES for details). Whether you are an avid angler seeking some of the best fishing available in the Bahamas, or you wish to provide a quality vacation for non-angling companions or family with minimal travel commitment – H2O Bonefishing on Grand Bahama Island is the ideal destination. The Pelican Bay Hotel is one of the newest hotel properties in the resort zone of Lucaya. It is located adjacent to a gorgeous white sandy beach and is within a two-minute walk of a wide variety of restaurants, loads of non-angling activities, as well as a new casino and golf courses. Outfitters, Greg Vincent and Jason Franklin are passionate anglers who have fished, guided and explored all over the world from Tierra del Fuego to Cuba, and many spots in between. They have pioneered a very unique program targeting big bonefish and a number of other flats species not normally associated with the traditional Bahamas trip. 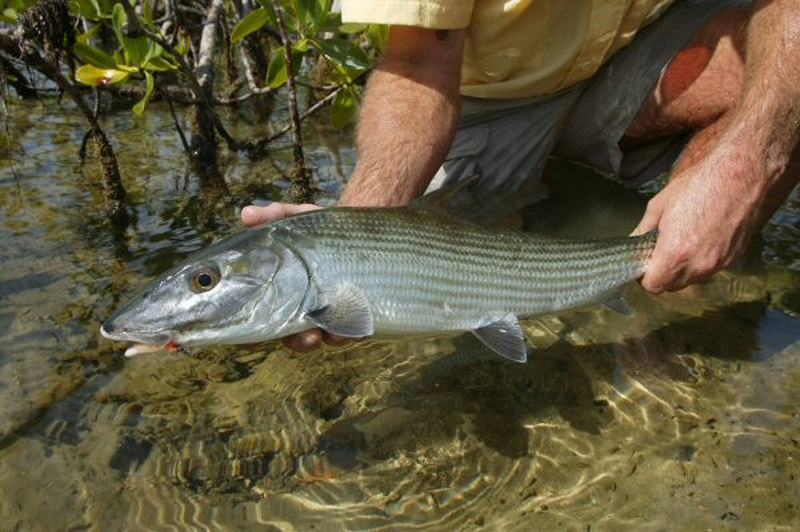 The remote north shore of Grand Bahama offers wading opportunities for bonefish as well as seasonal shots for permit, tarpon, jack crevalle, barracuda, sharks, mutton snapper, and even tailing triggerfish. H2O offers an afternoon offshore fly fishing program targeting yellowfin tuna and dorado as a combination flats / offshore day. Their “No Boundaries” program utilizes a 21’ Maverick that has opened up doors for exploring areas of the Little Bahama Bank not normally fished. 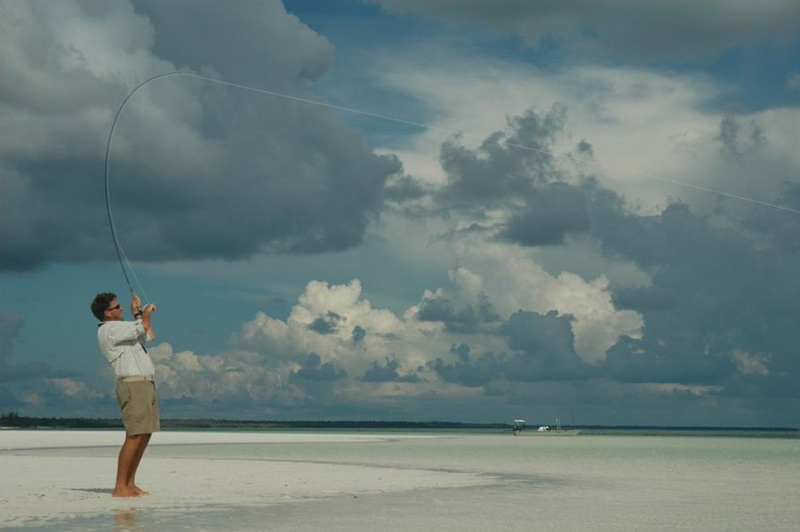 With H2O Bonefishing, you can experience saltwater flats fishing at its very best on the extensive remote flats of the northwest shore of Grand Bahama Island . . . and enjoy all of the comforts and amenities of resort living at the same time. Whether you are an avid angler seeking some of the best fishing available in the Bahamas, or you wish to provide a quality vacation for non-angling companions or family at absolutely no compromise to the quality of your fishing, then H2O Bonefishing and the Pelican Bay Hotel is the ideal destination. While most out island bonefish destinations require multiple connections through Nassau, or expensive charter flights, Freeport is serviced daily by multiple commercial carriers with inexpensive fares from numerous portals on the east coast. There is no destination that is easier to get to and more affordable in the Bahamas. H20 Bonefishing is a professional saltwater outfitter with modern equipment and highly trained guides that are on the water every month of the year. Grand Bahama’s extensive flats do not receive nearly the fishing pressure of the more high profile fisheries in the Bahamas such as Andros Island. It is also a fishery with much more species diversity than your average Bahamian angling destination. Located at the entrance to Grand Bahamas Bell Channel, this private waterfront resort sits adjacent to both the white sands of Lucaya beach and Count Bassie Square. This area of Freeport is the center of the islands’ entertainment with a wide selection of restaurants, bars, duty free shopping, water sports and evening entertainment. Guests can access the entire area with only a two-minute stroll, or remain poolside within the privacy of the resort and its gourmet restaurant. H2O Bonefishing’s uniqueness is its ability to provide world-class saltwater fly fishing along with ease of access to a myriad of alternative options for both anglers and their non-angling companions. H2O Bonefishing should never be overlooked by the most “hard-core” anglers who are also considering the more traditional “lodge” type of trip. This fishing is simply incredible, and H2O delivers the complete flats fishing experience. Avid anglers can rest assured that while providing spouses or families with a wonderful tropical vacation, they are also enjoying perhaps the most impressive, convenient and unique fishery in the Bahamas. The coolest part of the H2O Bahamas program is their never ending desire to develop their fishing program and offerings. They are constantly investing in new vehicles and boats, training their guides, targeting new species, and exploring their incredible fishery. The Island of Grand Bahama stretches ninety miles east to west, and its north shore’s vast area of creeks, cays and flats create hundreds of miles of fishable shoreline. H2O Bonefishing accesses this expansive fishery by SUV trailered skiffs which allow for convenience and flexibility with many of the north shore’s launching points. They employ four full time guides and run beautiful Maverick Mirage flats boats equipped with quick 85 horsepower Yahama outboards and modern electronics. Bottom structure varies from both hard and soft sand or grass flats to harder light coral or marl flats, creeks or cays . 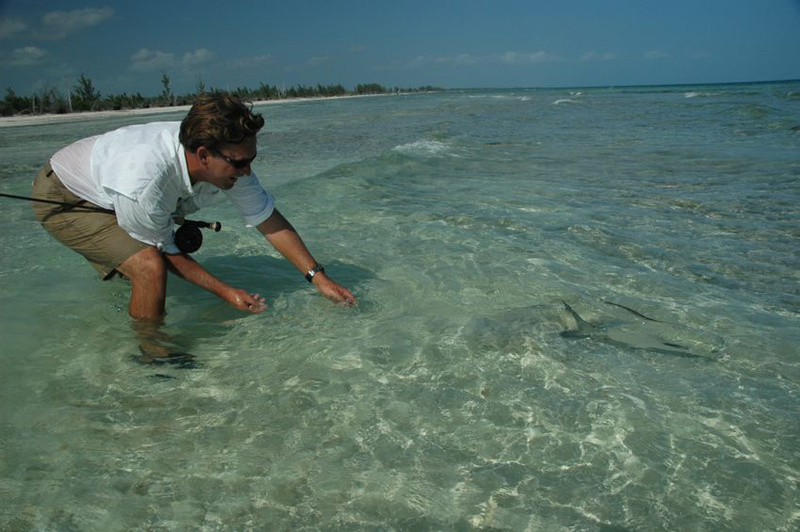 . . all of which provide excellent feeding areas for bonefish, permit, and numerous other species. 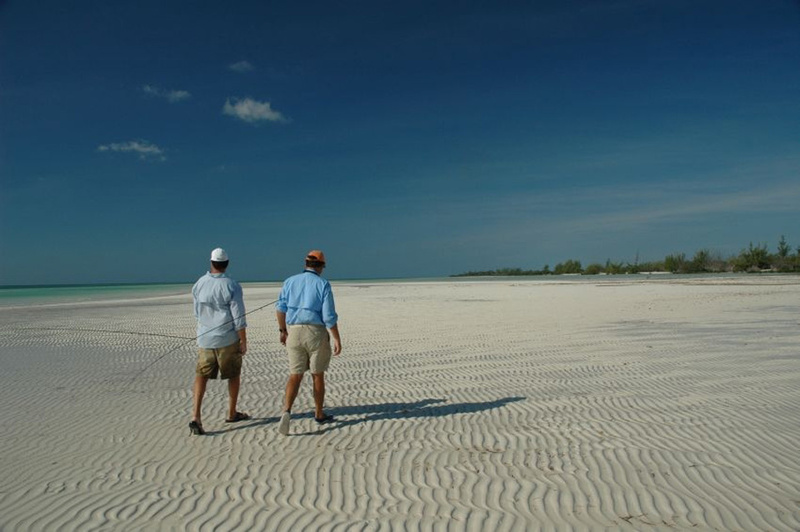 Whereas most fisheries in the Bahamas are nearly exclusively fished from the skiff, the north shore of Grand Bahama does have hard, wadeable, sandy flats that anglers frequently fish productively. Grand Bahama bonefish can vary greatly in size from smaller 2 to 3 pound fish that can be found in schools, to solitary pairs and small groups that will weigh into double figures. The average size of Grand Bahama bonefish is a healthy 4 to 5 pounds and fish of 7 and 8 pounds are almost a daily encounter. The trophy sized specimens of 10 + pounds can be located at any time with proper conditions. H2O’s fly caught record bonefish, so far, is a remarkable fish of 14 1/2 pounds! The Bahamas are normally booked as an exclusively bonefish fishery. However, the north shore of Grand Bahama Island offers opportunities for permit, tarpon (summer), jack crevalle, barracuda, sharks, mutton snapper, and even the occasional tailing triggerfish. 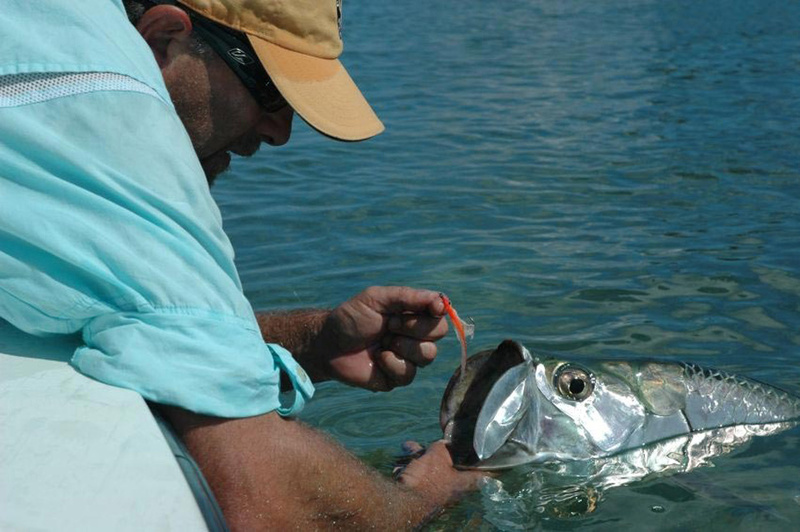 Tarpon are also often encountered during warmer months, and when conditions are right you would be remiss not to consider targeting the mighty Silver King. Barracuda and sharks can be found almost daily, and there is also the possibility of running into packs of the hard fighting horse eye jacks or jack crevalle that average 10 to 15 pounds. Greg and Jason have even dialed in a few flats that offer encounters with tailing triggerfish or hard fighting mutton snapper. Greg and Jason have recently invested in a speedy, brand new, 21 foot custom Maverick skiff designed to go further and faster than your traditional flats boat. 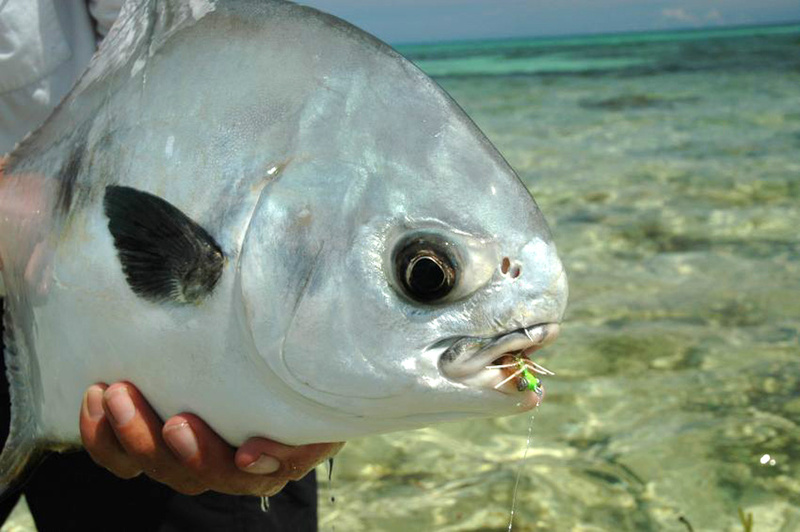 Totally unique to the Bahamas, their “No Boundaries” program allows anglers to comfortably venture to the most remote locations on the Little Bahama Bank targeting more diverse species with little competition. The No Boundaries program is usually a combination 5 night / 4 fishing day package split between their productive ‘local‘ program and this new venture; however, custom itineraries can easily be arranged. Inquire for details. 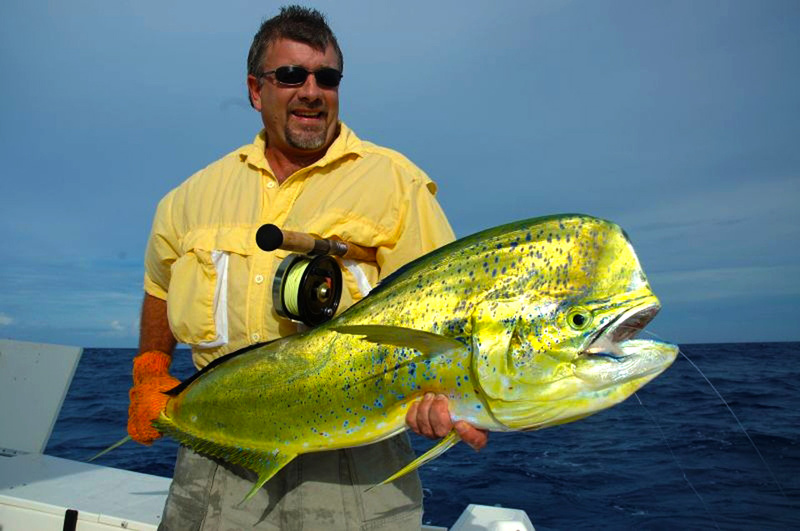 During the months of May – September, H2O offers an offshore fly fishing program for yellowfin tuna, dorado (mahi-mahi), skipjack and blackfin tuna. All are found feeding on or near the surface on calm afternoons during these summer months. What really makes it special is that die-hard anglers can enjoy a full day on the flats and head out for the evening offshore bite. Following a full day of bonefishing, anglers venture into the bluewater in a 33 foot cruiser around 3:00PM and fish until dark. 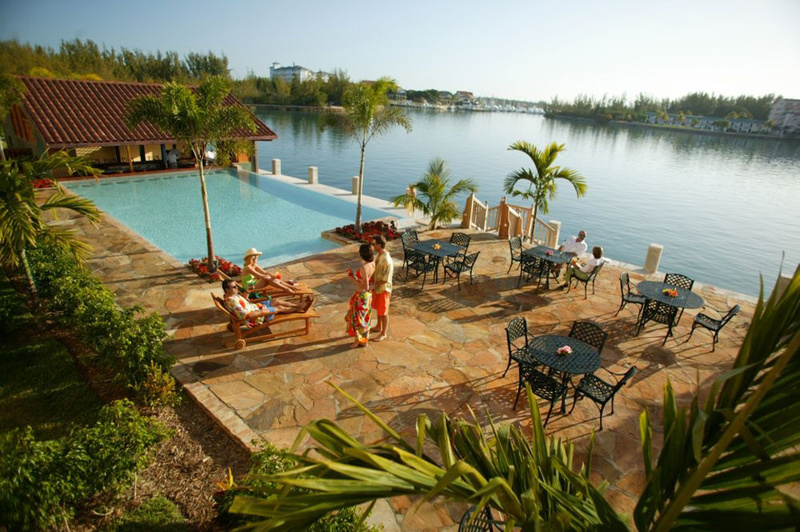 This is also a great option to consider for the afternoon of your arrival day on Grand Bahama. All offshore fly fishing equipment and flies are included in the offshore trips. Due to the nature of the program and ever changing fuel prices please inquire for current pricing and details. We feel that the Pelican Bay Hotel offers perfect accommodations for the family and the “hard-core” angler alike. 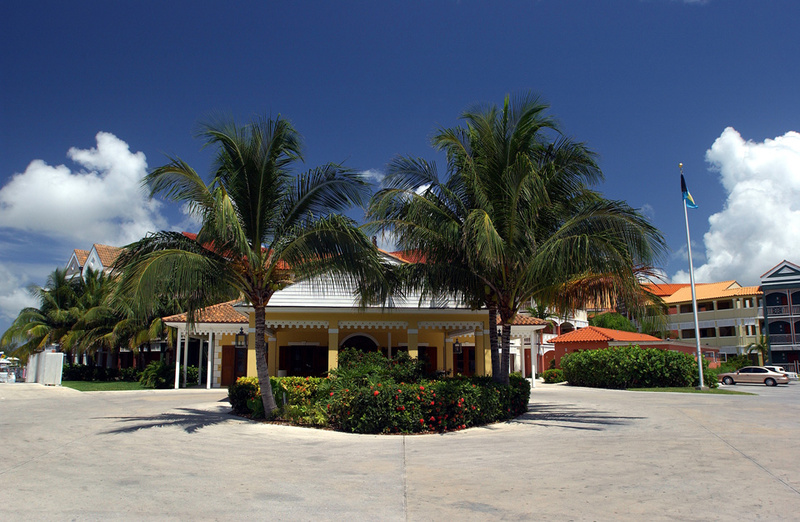 The hotel is in an ideal location – close to all the beach and town activities of Lucaya. Anglers who are not interested in non-angling activities can retreat to the quieter confines of the hotel, while non-anglers can send the family across the street to the Lucaya Beach, or take a swim in the hotel pool. Pelican Bay at Lucaya is Grand Bahama’s newest boutique hotel where visitors find Caribbean charm mixed together with Western European service. Danish architects incorporated sophisticated European design to create timeless Caribbean architecture and luxurious accommodations. Each of the 69 rooms has a private balcony that overlooks the courtyard area and the marina, shops and restaurants of Port Lucaya Marketplace. There is also high speed wireless internet access throughout the resort. A fee applies or use the complimentary business center that provides hardwire hook up. The spacious accommodations include your choice of king-size bed or twin double beds and boasts satellite TV, direct dial phone, refrigerator and in-room coffee maker. 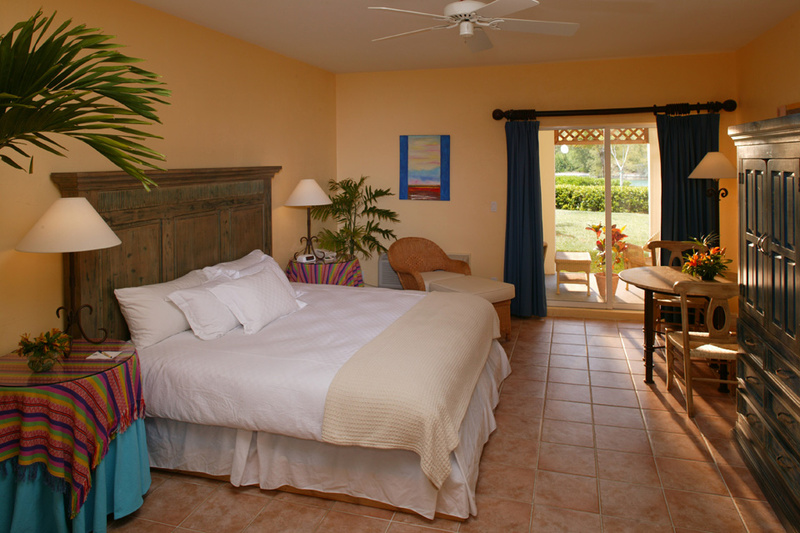 Rooms are decorated with colorful island spreads and drapery and white washed furniture. Floors are Italian tiled. Other guest amenities include a tropical fresh water pool, hot tub and pool bar. The Ferry House Restaurant, adjacent to the hotel, has established a new standard for excellence in fine dining on Grand Bahama. Having worked in some of the world’s finest restaurants, chefs create what they describe as “a blend of contemporary cuisine fused with the unique flavors of the Caribbean.” Menus change daily depending on availability of fresh, local seafood and fruit as well as the availability of foreign quality foods which are brought in by air on a regular basis. Also available are new one-bedroom suites offering unsurpassed luxury, lush tropical gardens and varying color-scheme. Mahogany wood and beautifully appointed custom décor highlight each of the 48 spacious, 750 square foot suites. Freshly baked croissants, breads, and newspapers are available at the suites every morning. In-room espresso machines with a variety of coffees enable guests to enjoy a private breakfast on their balconies overlooking the beautiful Bell Channel Bay. THERE IS NO EASIER ISLAND IN THE BAHAMAS TO GET TO! Several major airlines serve Freeport, Grand Bahama on a daily basis including American, United, Delta, Bahamasair, and JetBlue. These flights originate from Miami, Fort Lauderdale, and Atlanta. After clearing customs in Freeport, guests take a cab transfer to the hotel (approx. 15 minutes drive in an air-conditioned taxi). Charter flights are also an option from Ft. Lauderdale. Depart home city on a morning flight to Miami, Ft. Lauderdale, or Atlanta. Connect on to Freeport, Grand Bahama (FPO). Once through customs, guests take a cab transfer roughly 15 minutes to the hotel. On the evening of arrival, meet with H2O Bonefishing staff member for orientation. After a free breakfast at the poolside restaurant at the Pelican Bay Hotel, anglers are met in the lobby by their guide and drive approximately 10-25 minutes pulling the skiff to one of several remote launching points on both the north or south shores of Grand Bahama Island. Spend a full day on the water with one of H2O’s four full time guides. Lunch is taken on the water and anglers are usually back to the hotel by 4:30PM in time for cocktails and a night on the town in the Lucaya resort area of Freeport. Anglers participating in the evening offshore or no boundaries programs return to the hotel a little earlier, freshen up, and head back out for four hours of fishing! Depending on flight departure time, guests typically check out after a leisurely brunch, and are transferred to the Freeport airport via taxicab for the flight back to the States. One thing people often neglect when considering a trip to the Bahamas is the weather. The Bahamas are actually in the Atlantic Ocean, not the Caribbean Sea. As a result the Bahamas are more susceptible to northerly cold fronts than their Caribbean neighbors to the south. However, some of the largest bonefish are caught during the winter when the weather cooperates. The summer fishing should not be ignored either! There are often great chances for other species like tarpon and permit during the summer months, the winds lay down, and weather is usually very predictable when tropical storms are not present. H2O’s summer offshore program for tuna and dorado can also be gangbusters – and is great to combine with a morning bonefish session. The autumn often enjoys beautiful springlike conditions and can be very productive on the flats for all species as well. Peak Hurricane Season! There is a serious risk of lousy weather, however we have had wonderful trips during this time frame — especially if you are flexible and able to book on short notice. A wide variety of options for non-anglers exist due to H2O’s location immediately adjacent to the island’s main entertainment area of Count Bassie Square (only a 60 second walk from the resort) and is the heartbeat of the island’s entertainment. You will never need to arrange transport of any kind. The new casino is only a short two minute stroll from the resort lobby. In addition to all the customary Caribbean water sports that are available i.e. parasailing, snorkeling trips, glass bottom boat trips, scuba diving, sea kayaking, sailing, jet ski rental, deep sea fishing etc., there are also organized island tours including eco tours of the many more remote areas of the island — kayak tours, jeep tours and many other nature related activities. 5 Golf courses to choose from including 2 USGA certified 18 hole championship courses at the Lucaya and Reef courses. Both are within a mile of the resort. A short boat ride departs from the hotel several times a day to swim and interact with Atlantic Bottlenose Dolphins. 2 tank and 1 tank dives depart from within yards of your hotel room every day to the great wall and reef diving on the south shore. See parts of the beautiful island by horseback and ride on the world famous Gold Rock beach in Grand Bahama’s largest national park with miles upon miles of brilliant white sand. 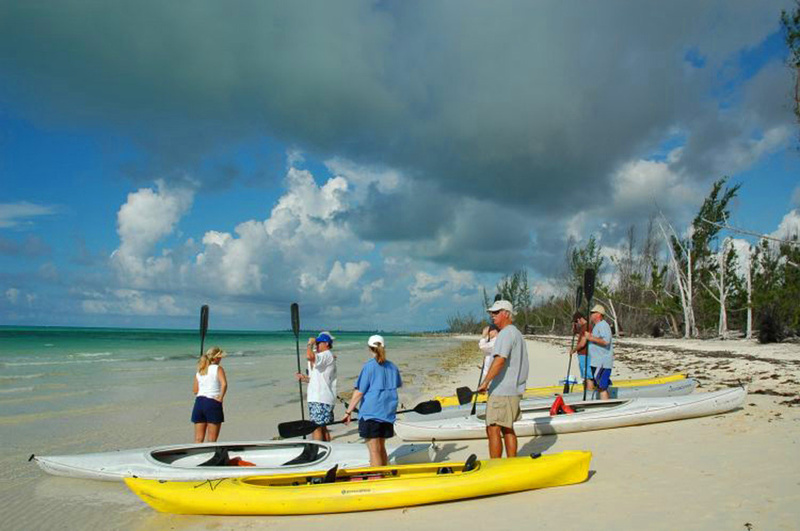 There are also daily sea kayaking tours and native tours to the settlements of the East or West End to experience the more traditional Bahamian way of life. Deep sea fishing, reef fishing snorkeling trips, glass bottom boat tours, picnic and booze cruises, parasailing, jet skiing, shell collecting tours, sea kayaking tours. Gambling at a choice of two casinos, duty free shopping, fine restaurants, bars, nightclubs, shell collecting, barbecues, nightly dancing and a host of other activities around the island. H2O Bonefishing provides exclusive packages to ensure that dedicated bonefishing clients have the availability for their multi day fishing trips. We cannot charter H2O Bonefishing’s boats and guides on a daily basis to non Pelican Bay Hotel guests. Customized packages to include extra nights before and/or after your fishing days, along with non-angling activities, can easily be arranged. Please inquire for non-angling rates, as well as suite upgrades. Fly and conventional tackle may be rented for $20/day. Airfare to Freeport, Grand Bahama (FPO); Tips for fishing guide; Alcoholic beverages; Equipment rentals ($20 per day); Flies & terminal tackle; Dinner Meals; Taxi Transportation to and from the airport. 50% deposit required with reservation. No booking is considered confirmed until receipt of deposit. Final payment must be paid 45 or more days prior to arrival date. Any bookings requested within 60 days of reservation date must be paid in full. Cancellations made 90 days or more prior to reservation date is a full refund. Cancellations made between 45 to 89 days prior to reservation date is a 50% refund of the deposit amount ie. 25% of total package. Cancellations made less than 45 days to arrival date is no refund. If a cancelled package is re-sold then a full refund will be sent minus a $ 100 fee per angler. 50% deposit required with Reservations. No booking is considered confirmed until receipt of deposit. Final payment must be paid 90 or more days prior to arrival date. Full refund if package is cancelled before January 1st. 50 % refund of deposit if cancelled after January 1st and 90 or more days from arrival date. 50 % refund of total package (deposit) if cancellation is made 61 to 89 days prior to arrival date. There is no refund for cancellations made on or within 60 days of arrival date. If a cancelled package is re-sold then a full refund will be sent minus a $ 100 fee per angler.